Derry City's Ciaron Harkin says he is enjoying the challenge of playing in a "more technical" league as he begins his second stint at the Brandywell. The midfielder spent two years in the Irish Premiership with Coleraine and was part of their Irish Cup winning squad last season. He returned to his hometown club as part of a swap deal in January. The Candystripes beat Waterford 3-2 on Monday to secure their second win of the new campaign. Harkin, 22, was a regular in the Coleraine midfield last season as the Bannsiders narrowly missed out on the league title on the final day having lost just once all season. 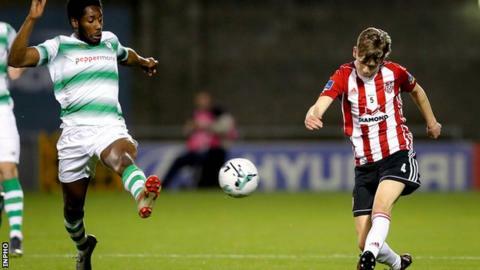 He returned to full-time football last month, four years after leaving Derry to join Institute as an 18-year-old. "It is very different (from the Irish League), I can see even just from the last three games," said Harkin. "A lot of players in this league want to stay on the ball, move it and pass it. They are trying to move the teams rather than the ball." On Monday the defensive midfielder scored his first senior goal for the club. He has started all three league games under manager Declan Devine, who replaced Kenny Shiels following the Candystripes' disappointing 2018 campaign. "I had a spell before but only had two appearances. Coming back and getting that goal meant a lot," Harkin said on Monday. "Winning any match at the Brandywell means loads to me as a supporter and a player." Derry travel to Turner's Cross to take on last season's runners up Cork City on Friday.